Hi - Daniele here this week and it's my turn to set the challenge. I love all things girly with pretty colours so this week I got to choose the theme, Swirls and Pearls with pretty pastels. We are very lucky this week as the lovely peeps at Letraset UK are sponsoring this challenge - the winner will receive a pack of Ultrafine Promarkers for Hair, so make sure you get your entries in on time! Now, the winners of challenge 43 which was Mystical and Magical. Fabulous creations as ever from everyone who joined in! The challenge is open until Sunday 20 November at 12noon GMT and any entries that do not follow our challenge rules will not be eligible for any prizes so please read them carefully! Ruth: I've used papers and image from Pretty Sweet - she's been coloured with Promarkers and liquid pearls and I've added swirls with seed beads! Emma hello there, this week I used a Fairy Flutterby stamp and papers from the Pretty Sweet CD to make my card, I coloured with Distress inks, all of which are available in the Polkadoodles shop. Daniele: I love all things girly with pretty colours so this week I got to choose the theme, Swirls and Pearls with pretty pastels. I love the images and papers of the Pretty Sweet Cd as they are so apt for this challenge.The image I have used is called Maddie. Lana - For my card I have used the 'Pretty Sweet' Cd for the image, dotty paper and also the sentiment. I used 'Sugar Birdies' for the swirly flower paper. The flowers were made using a mixture and my image was coloured using copics. Enfys: I cut a base card using my Cricut, then added a pink circle, some stitching and a stamped swirl. The image is from Magical Winter and I think it makes a perfectly sweet Christmas card! Louise For my card this week I have used papers and a image from the Pretty Sweet Cd and some swirls cut from a sizzix die. Norine - This week I used a cute, clean and simple image from the Candy Doodles cd for the base of my design, the background patterned paper and the sentiment are from Pretty Sweet. 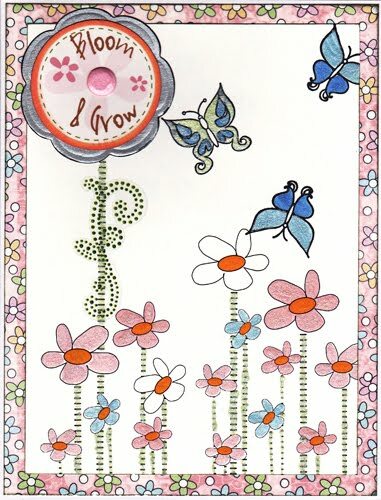 I added some butterfly stamps from Fairy Flutterfly and then I colored with Radiant Pearls! I added a Candi brad and some bling to finish it off. Colette - Papers, image and sentiment from Pretty Sweet for me too. I also used X-cut scalloped rectangle dies, and a Bazzill Jewel template for the pearl swirls. Alan: I wanted to put a twist. The new CD from Polka Doodles called PRETTY TUFF its a great cd for The boys filled with great imagery so thats where l started. The Swirls and the Topper were made by using my cricut. The flowers came from the CD DOUBLE SPRINKLES OF KRAFT once again the CD's all mix and match while standing on their own. 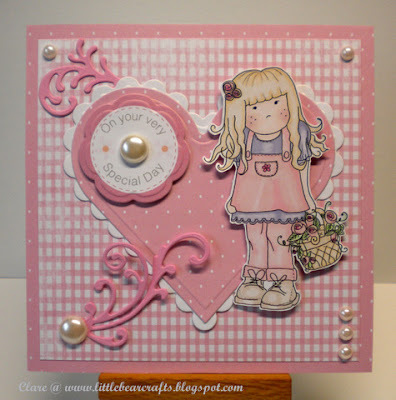 Lis-m : I have used the adorable "Pretty Sweet" cd for my card this week, I love all the pastels shades... I have coloured my image in pastel shades of promarkers too... the flowers are die cut, and embellished with a pearl. Josie: This week I used the Pretty Sweet Cd Rom. I absolutely love this backing paper. So cosy! I covered the sentiment and swirls in Cosmic Shimmer Glitter. The swirls and image are coloured with Pro markers. 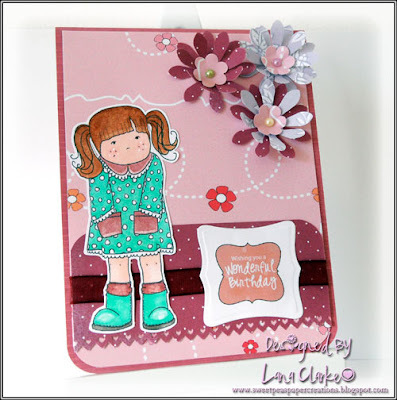 Lou: I have also used the Pretty Sweet CD for my card with very simple mat and layering. The image has been mounted onto a large heart adorned with flowers and swirls. My pearl element is the 2 decorative pins used to hold the shabby ribbon roses in place. Doreen: I've also used the image from the Pretty Sweet CD. The paper I've used from the Sundae of Seasons CD. I love the purple colours. I colored the image with my copics. The swirl is a Die Cut from Tim Holtz. Then I embellished with flowers, lace and pearls. Clare: I've used an image, papers and sentiment from the Pretty Sweet mini CD. I think this girl is so pretty and I enjoyed colouring her with a combination of Promarkers and Flexmarkers. 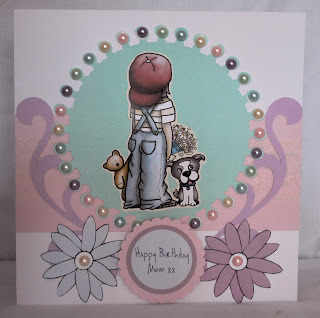 Guest Designer Stephanie-Emma - I used one of the gorgeous girls from Pretty sweet, with some colour core cardstock and some pretty flat backed pearls. Guest Designer Nelly - I used lots of papers, images and elements from Double sprinkles of Kraft to make my circle scallop easel card as well as adding swirls, dots and flower centres with flat back pearls. 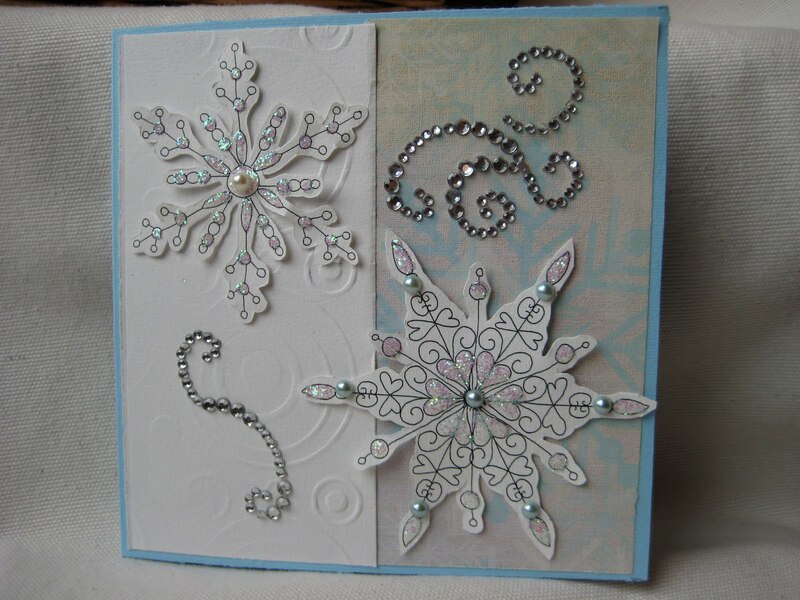 Miria This week I went Christmassy with these gorgeous snowflakes and paper from Magical Winter. I just added some glitter, swirls and pearls from stash. Joanna: The papers I’ve used are from the super fab Pretty Sweet CD and were matted on pastel pink card stock. I had great fun playing with the image – it’s been put together from the images Pretty Sweet and Pretty Tuff CDs. The swirls were cut using MM Slice and decorated with Liquid Pearls. To embellish I used lots of machine stitching, glitter and flowers. Shell... for my card this week i have used my favorite papers from the Pretty Sweet cd, the image is Maxine the sentiment is from the same set, she has been coloured with copics, the pearls and flowers are from my stash. Anne - I've used two of Nikky's fab CD's for this one. Well why not eh? First I printed out the papers from the Pretty Sweet CD. Then I opened the tree with the little birdies on from Candy Doodles CD in my graphics programme and then it was back to Pretty Sweet to import the gorgeous Amelia. Dee: I've use the Pretty Sweet CD for my card this week. There are no swirls, but plenty of pearls and pretty greens, peaches and pinks. I cut squares from different backing papers and fixed to the card. After drawing on faux stitches it looks like patchwork. I've also added plenty of bakers twine to add some extra interest and texture. 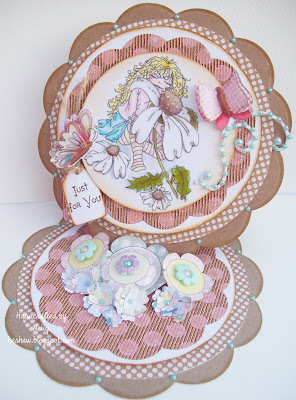 Fliss: I too have used the Pretty Sweet CD as I love the gorgeous papers on there. I used the papers for matting and layering and then embossed some white linen card with a flourish folder and swiped it with Brilliance purple ink. I coloured the sweet image with Promarkers, cut her out and added her with foam tape. I finished off with die cut swirls, punched flowers with pearl centres and a sentiment. Shary I've used a Polka Doodle stamp image and sentiment that were free with Papercraft Essentials mag and have been coloured with copics (these co-ordinate and can be found as images on the Sundae of Seasons CD). The papers are also by Nikky and came free with the Making Cards mag. The swirls are cut with the same papers using a die. Good luck! Please remember our rules and the challenge ends at 12noon GMT on Sunday 20 November. As always, the work of the DT is FANTASTIC. Such a talented bunch!!! Thanks for the inspiration. These samples from the DT members are simply outstanding. Thanks so much for the inspiration! I often inspired of the dt cards collection !!! !Such a looking talented bunch!!!! Thanks so much for picking my card for your top spot on #43!